The comptometer was the first commercially successful key-driven mechanical calculator, patented in the United States by Dorr E. Felt in 1887. A key-driven calculator is extremely fast because each key adds or subtracts its value to the accumulator as soon as it is pressed and a skilled operator can enter all of the digits of a number simultaneously, using as many fingers as required, making them sometimes faster to use than electronic calculators. Consequently, in specialised applications, comptometers remained in use in limited numbers into the early 1990s, but except for museum pieces, they have all now been superseded by electronic calculators and computers. Manufactured without interruption from 1887 to the mid-1970s, it was continuously improved. The mechanical versions were made faster and more reliable, and then a line of electro-mechanical models was added in the 1930s. Notably, it was the first mechanical calculator to receive an all-electronic calculator engine in 1961, with the ANITA Mark VII model released by Sumlock Comptometer. This created the link between the mechanical calculator industries and the electronic. 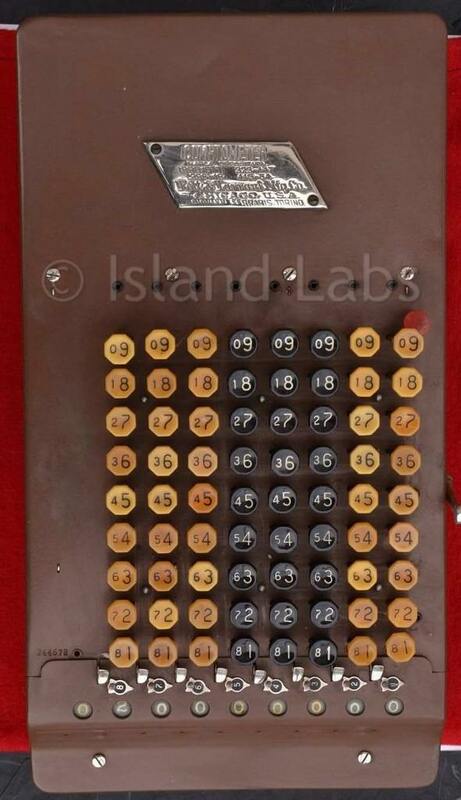 Although the comptometer was primarily an adding machine, it could also do subtractions, multiplication and division. Its keyboard consisted of eight or more columns of nine keys each. Special comptometers with different key arrays were produced for a variety of special purposes, including calculating currency exchanges, times and Imperial weights. The name comptometer was formerly in full use as a generic name for this class of calculating machine. The comptometer is the direct descendant of the key-driven machine of Thomas Hill patented in the United States in 1857 and of the Pascaline invented by Blaise Pascal in France in 1642. By just replacing the input wheels of the Pascaline by the columns of keys of Hill's machine, the comptometer was invented. Addition is performed exactly the same way, and both the Pascaline and the Comptometer make use of the 9's complement method for subtraction, but in the case of the comptometer it is the operator who must choose the right keys for the subtrahend (each key has its 9's complement written in miniature letter next to it). Dorr Felt began his work on comptometer in 1882 and started building the first prototype during the American Thanksgiving holidays of 1884. Because of his limited amount of money, he used a macaroni box for the outside box, and skewers, staples and rubber bands for the mechanism inside. It was finished soon after New Year's Day, 1885. This prototype, called the macaroni box, is in the Smithsonian Institution in Washington, D.C., United States. Shortly after, Robert Tarrant, the owner of a Chicago workshop, gave Mr Felt a salary of $6 a week, a bench to work on and what would add up to $5,000 to build his first practical machine which he finished in the autumn of 1886. By September 1887, eight production machines had been built. The original comptometer design was patented by Felt, on July 19, 1887, and on October 11, 1887. Two years later, on June 11, 1889, he was granted a patent for the Comptograph. A Comptograph is a Comptometer with a printing mechanism making it more like a key-set calculating machine (even though the keys are registered as they are typed and not when a handle is pulled) therefore slower and more complicated to operate. It was the first printing-adding machine design to use individualised type impression which made its printed output very legible. The first comptograph was sold to the Merchants & Manufacturers National Bank of Pittsburgh, PA. in December 1889. It was the first sale of a recording-adding machine ever. This machine is now on display at the Smithsonian Institution in Washington, D.C. The Felt & Tarrant Manufacturing Company built both comptometers and comptographs throughout the 1890s. In 1902, the Comptograph Company was set up to manufacture comptographs exclusively but was shut down at the beginning of World War I.
Forty years later, in the mid-1950s, the Comptometer Corporation reused the name Comptograph for a line of 10 key printing machines. 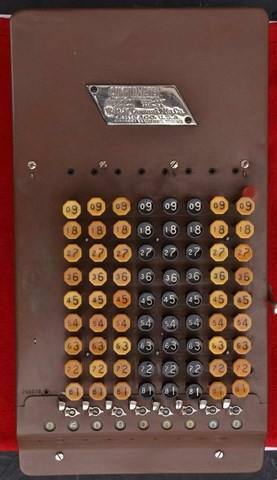 The comptometer was the first machine in production to challenge the supremacy of the arithmometer and its clones; but not immediately, it took almost three years to sell the first hundred machines. In repairing a disordered "Comptometer," it is necessary first to find the cause of the trouble. In a highly organised piece of machinery, the difficulty may originate in a section quite remote from whom it appears to be. If the original cause of the disorder is not surely located, it is useless to begin taking out mechanism with the hope of accidentally correcting it. The new form or zeroizing, or so-called canceling mechanism used in Model H, offers a means of tracing or locating the cause of the disorder more readily than with former models, as the act of zeroizing such machines separates the carrying and numeral wheel mechanism from the key actuating mechanism, thus isolating one device from the other so that each may be operated and tested independently of the other. Again the independent arrangement allows the removal of the whole series of carrying mechanism in a unit, which to the experienced repairman will be found a still further means of isolation and help in repair work. The first thing to do is to pull the zeroizing handle forward and release it. This separates the carrying mechanism and numeral wheels from the key-stroke and actuating mechanism, which will help to locate the trouble. Place your finger under the rock frame pivot shaft 865, located at the front of the machine, which is the shaft that rocks upward and forward when you cancel or clear the mechanism. While holding the shaft forward note the following: First, whether the wheels all zeroize correctly; second, whether the segment levers return correctly in each column by alternately striking all nine of the keys in each column; third, roll the numeral wheels with the finger until they show the nine in the proper position; then let them return slowly to determine whether they are free from obstruction and back under the spring action as they should. If free, they should return with a good sharp response. If the trouble is located by any of these tests, it will determine the column to be examined and whether it is in the key-actuating mechanism or in the carrying mechanism. Attention should be given to see that every spring is in its normal position and has not become unhooked and that no obstacle has become lodged in the mechanism. Sometimes pins, toothpicks, brush bristles, broom straws, wires or pieces of paperwork in through the casing; or by removal of sight plate, are purposely shoved through and by moving the machine around become lodged in the delicate mechanism enough to interfere with its proper working. If in making the above tests the trouble does not show, then pull forward the zeroizing crank and let it return; then while depressing a key, watch the rock frame toggles (Part Nos. 1241, 823 and 865, see Fig. Nos. 1, 4 and 5). Before the key is depressed, they should be in the position shown in Fig. 1, and after depressing in the position shown in Fig. 5. If the toggle lock does not makeup, i.e. straighten out, as in Fig. 5 and the numeral wheels all register zero when the crank is pulled forward, place the finger on the shaft 865 and try to press it down. If it does not yield and the toggle lock does not makeup under slight pressure, then depress the number (1) keys in each column until it does makeup. It must be understood that these tests are merely to help in locating the trouble and form a means of isolating the groups of mechanism that perform specific functions in the operation of the machine. The instructions for the perfect adjustment of these trains of the mechanism will be found under their particular heading in "Learning the Action." If the machine is not locked; if every column carries at the right point; if no spring in any part of the device is unhooked; and if satisfied that the trouble is not due to improper operating, it will then be necessary to examine and compare with one another the action of every column and try to locate the cause of the trouble. In case of finding it, put in a new part in place of the injured one. In case of failure to surely determine the cause of the trouble, report the number of the machine, describing the symptoms; or else ship the device to the factory. If after putting in a new part it does not then work right, either the real cause of the difficulty has not been discovered, or the parts have not been adequately replaced. Never try to change or adjust a new piece. To do so must necessarily disorder it, because every new part will work in any machine of the same model without any change, and therefore it can not work correctly if changed in any way outside of the factory. Never try to take any part out, in the presence of others, until after you have taken that same part out and replaced it several times alone, at your own office.